Whichever way you look at it, being bilingual is an advantage. With the growth of the Latino market in this country, most companies require workers who not only speak Spanish, but also understand the Latino culture. Therefore, you must: distinguish between speaking two languages ​​and two cultures, understand what industries or companies are seeking such workers, and where to go to find job listings. One thing is knowing how to speak a language and quite another is to understand both cultures. If you are lucky enough to speak English and Spanish perfectly, working doors are bound to open. If you consider yourself well trained to understand the Latino culture, many companies will appreciate you even more. The most important thing is to understand what the company requires of bilingual worker. Does it clearly specify in the job description "seeking a bilingual person" or is it just a plus for the position in question? Gone are the days when occupying bilingual positions required merely to translate some documents or tend to customers by phone. Companies that seek to address the Latino market have realized that they need bilingual services to develop market strategies, physically working in sales positions, or to create new products with the Latino customer in mind. So they have opened the doors to (academically-prepared) Latinos in fields such as telecommunications, insurance, marketing, advertising, and almost any industry that serves Latino customers. Some of the web pages devoted to advertise specific jobs for bilingual employees include: latinosforhire.com , bilingualjobs.net , latpro.com , http://www.bilingualcareer.com , bilingualcrossing.com , hispanic-jobs.com. Do not just search for bilingual jobs in the pages mentioned here. Almost all major job posting sites (Monster.com, Indeed.com, SimplyHired.com, and others) allow you to write "bilingual" in the search box. That way, you will have the opportunity to discover even more listings that may not have been included in the specific pages for bilingual workers. Do I Include my Language Abilities in my Resume? When it comes to highlighting a language in your resume, it is customary to include it at the end, as an additional skill. But if it's a job that requires a bilingual person, do not make the mistake of hiding that attribute. Be sure to include it in the summary at the beginning of your resume, where you highlight your most important qualifications. Also, if you have previous work experience using that language, include it in great detail. Be sure to emphasize the fact that you are bilingual in your cover letter. In addition, concentrate on how your training can benefit the company. If the company seeks an insurance salesman who speaks Spanish, emphasize that your value lies not only in the language, but also that you understand the Latino culture, and that this can result in an increase in sales for the organization. Find ways to present concrete benefits of being bilingual/bicultural. In any document that mentions your ability to speak other languages, always specify your proficiency level. If Spanish is your native language, mention that. The wording most commonly used to describe a proficiency level is beginner, intermediate or expert (native). If you have taken classes to learn other languages apart from Spanish and English, also mention them (with corresponding level). 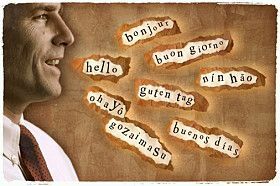 Your initiative to learn other languages ​​demonstrates your ability to learn and manage in other cultures. One more advantage in your favor!